Traditional cantucci di Prato are small almond biscotti, often served at the conclusion of an Italian meal alongside vin santo or espresso. I, not being Italian, like to eat them for breakfast. (Cookies for breakfast: undoubtedly a true perk of adulthood.) Already crunchy and substantial, the biscotti get a nutritional nudge from whole wheat flour and extra almonds in my tweaked recipe, derived from Biscotti: Recipes from the Kitchen of the American Academy in Rome (p 20). Here’s my version, great with a cappucino for breakfast, aside a glass of vin santo or even dipped into milk. The fennel flavor is gentle, not overpowering, and beneficial: fennel is said to remedy digestive upset and respiratory distress. Combine flour, cornmeal, baking powder, and salt in a bowl and set aside. Place butter and sugar into the bowl of a stand mixer; beat on high speed until light and fluffy. Add egg; continue beating until well incorporated. Blend in the flour mixture in two batches, then fold in the almonds and fennel seeds. Refrigerate the dough for 15 minutes. Preheat oven to 350 degrees. Line a half-sheet pan with parchment paper. Remove dough from the refrigerator and divide it into two. Shape each half into long, skinny (1-1/2 inch wide) logs. Place dough logs onto the prepared sheet pan. Bake for 20 minutes. Remove from the oven, allow to cool for 10 minutes, then slice logs into 1-inch thick fingers using a serrated knife. Return slices, cut side down, to the parchment-lined baking pan. Bake for 8-10 minutes until golden brown. 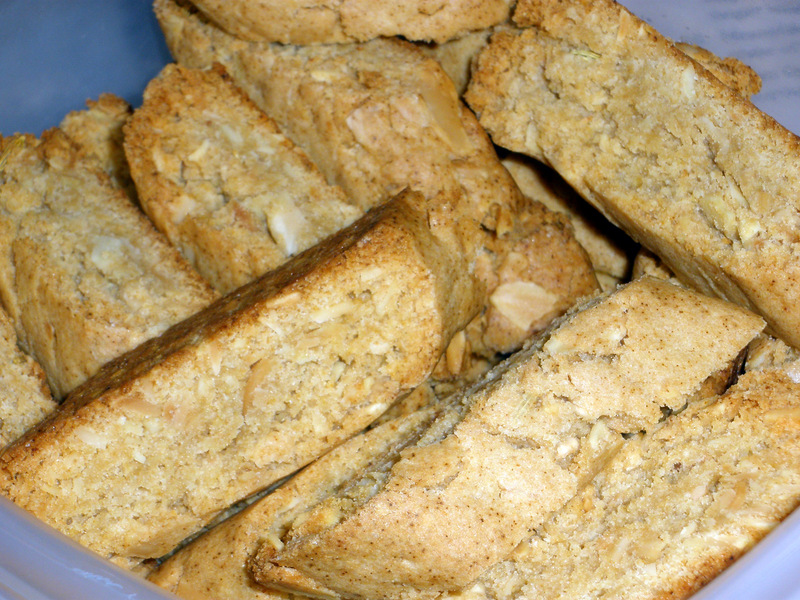 Biscotti will keep for weeks if stored in an airtight container. I like your WW Biscotti almond recipe. Going to add them to my Christmas baking list. Can you tell that I really like biscotti?